Travis Smith prepares the spare bedroom in the house that he shares with his partner, Emily Plommer. The two Vancouver residents rent out the room on Airbnb. Vancouver Airbnb hosts renting spare bedrooms in their homes through Airbnb say they are not taking potential housing off the market. 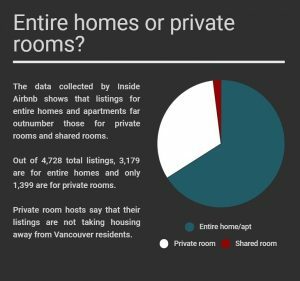 As debate continues around the impact of Airbnb on the city’s housing market, Vancouverites who rent spare rooms to short-term guests, which represents a third of Vancouver’s Airbnb listings, say negative attitudes towards hosts who rent out entire homes should not apply to them. “We wouldn’t be renting out our spare bedroom to a roommate,” says Emily Plommer. “We want to have a kid in the next year.” She and her partner, Travis Smith, are tenants of a house near the city’s Chinatown where they rent out their second bedroom between 21 and 28 nights a month. But housing experts still worry that these short-term rentals for private rooms are putting tenants in competition with tourists. “Rooming houses have been a very important source of affordable housing in Vancouver historically. It’s troubling if this historically important source of affordable rental housing in Vancouver is being converted to tourist use,” says Karen Sawatzky. Sawatzky, a graduate student whose research at Simon Fraser University looks at the impact of Airbnb on the city’s housing market, says that part of the reason for the city zoning bylaw that makes short-term rentals illegal is because housing is needed by people in the city. Sawatzky says that while private room rentals are a more complicated issue than entire home rentals, hosts listing spare rooms on Airbnb will need to be encouraged through either incentives or penalties to rent to residents instead. A New York report on the impact of Airbnb repeated Sawatzky’s concern that, while the impact may not be the same as entire home rentals, these single room rentals are still being made unavailable for long-term renters. It found that most short-term private room rentals were being rented for at least 182 days. Hosts like Plommer and Smith maintain that they are not taking rooms away from potential long-term renters and that they are actually helping new Vancouver residents. They see a role for short-term rentals that is similar to boarding houses that help people immigrate from around the world. “If you’re coming from who knows where around the world, you can’t just secure a living accommodation that’s going to be affordable. Airbnb allows people to come for two or three weeks to get a bank account, to get their new address,” says Plommer. As well, the flexibility that comes with short-term renting is something Plommer and Smith would be reluctant to give up. Plommer says that, with Airbnb, it is easy for them to say, “No, we’re going to have this Friday night to ourselves or we have family in town,” something that would not be possible with a long-term tenant. In the less busy fall season, they only book through Airbnb for 70 per cent of the month. But not every room listed as a private room on Airbnb is necessarily someone’s spare bedroom. In the case of the house that Carolina Camargo lived in, the landlords rent out the entire space as at least five separate listings. Camargo moved into a room expecting to stay. Later she discovered that her landlords planned to convert the space, including her room, into an Airbnb rental for the summer. She had signed a rental agreement from January to April under the assumption that the agreement could then be extended on a month-to-month basis for as long as she wanted to stay. Instead, Camargo found out that her landlords expected her and the other tenants in the house to move out on April 30 to make way for Airbnb renters in the busy summer months. She decided not to wait and moved out in February. Camargo is waiting to hear back after filing a complaint with the city of Vancouver and with her MLA’s office. While renters like Camargo worry about having to compete with Airbnb guests for space, some anti-Airbnb advocates do not have the same negative reaction to private room rentals as they do to entire home rentals. “If the person who listed their suite on Airbnb is offering a bed or a room in their own apartment and they are remaining in the apartment while that guest is there, I don’t see a problem with that,” says Ulrike Rodrigues, a condo owner who also runs the Facebook page “Homes Not Hotels.” She has been publicly complaining about condo owners in her building renting out entire suites like hotel rooms since last fall. Rodrigues’ main concern with Airbnb is that hosts can rent entire suites and that Airbnb guests are then left with unsupervised access to shared buildings. 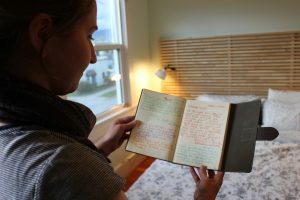 Emily Plommer takes a look through the guest book that she leaves in the room. It is filled with messages of thanks and friendship from the guests that have stayed there. One thing that Airbnb hosts like Plommer and Smith and residents of shared buildings like Rodrigues‘ agree on is that the home-sharing website is about hosts interacting with their guests. “Airbnb originally was supposed to be about meeting strangers and connecting with strangers. It’s about people talking to people,” says Rodrigues. For Smith, that interaction is what sets private rooms apart from listings for entire homes.